Brand new 3 double bedroom, detached villa (sleeps 6) with private pool and garden ready for summer 2008. Set in an exclusive new development of individually designed properties overlooking the spectacular views of the hills and villages of the Peyia/Kissonerga area, as well as Banana Bay. Located just a 5 minute walk from all of the local amenities that Coral Bay Resort has to offer including quality restaurants, tavernas, beach bars, banks and boutiques. The best sandy beach in the area is within a 10 minute walk. A regular bus service runs from Coral Bay village to Paphos old town and harbour, with its bustling markets, shops and sea front tavernas, as well as carting, Aphrodite Water park and the historic Tomb of the Kings attraction. This villa has been decorated and finished to a high standard with elegant interiors and includes all the home comforts you would expect. I live in north London (Stanmore Middlesex) I work for a company based in Blackburn called RENEW as in insurance inspector Year purchased: 2000. Why the owner chose a home in this location. 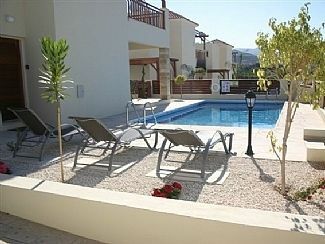 I decided to buy my villa's in this location because it is only a 5 minute walk away from Coral Bay Resort. ive been there before i purchased the villa and loved the stay so decided to buy, as its a place i would visit again , people are friendly, its like my second home .It is only 200 metres away from the sea which is perfect for a morning or late night walk along the beach. and Cyprus weather is good all year round. So if you have any questions please don't hesitate to contact me on 07515645877. The main bathroom is located on the 1st floor with bath/overhead shower, wc and wash basin. A shower room with wc and hand basin is located on the ground floor opposite bedroom 1. Beautifully furnished in earthy colours. Open plan lounge/dining room with a two and three seater sofa, coffee table, 37' wide screen TV/DVD, Nilesat, dining table to seat 6 and stereo system. Patio doors lead out to the terrace and pool area. The kitchen is fully equipped with, cooker, hob, fridge/freezer, hair dryer, dishwasher, washing machine, kettle, microwave, toaster, iron/ironing board and cooking utensils. Is open plan to the living/dining room with patio doors leading to pool area. Skiing in Cyprus can be enjoyed on the slopes of Mount Olympus, from the beginning of January to the end of March. Mount Olympus is 3km from Troodos Hill Resort. Troodos is approx 71 miles from Paphos. 3 golf courses are situated in the area all within a 20 - 40 minute drive of the villa. The main 2 golf courses are at Secret Valley Golf Club which is 18km east of Paphos, and Tsada Golf Club which is 20 minutes drive north of Paphos. Both are 18 hole courses. This was actually my 2nd stay at this Villa which again was thoroughly enjoyable. The villa is kept well up to a high standard and is always found clean and tidy. It's a lovely, peaceful, location with shops, restaurant's and places to stop for a nice glass of wine or a beer. which and are only 5-10 minutes walk away. The beaches are lovely and are very near by too. It is cheaper to shop at one of the larger supermarkets such as Lidil which is approx. 10 minutes ride in a car or by using the local bus service. We had 2-3 nights out on the patio having a BBQ which was really nice, there is sufficient seating down stairs, although there isn't at present any seating upstairs we didn't really feel the need to want to sit upstairs on the patio as it was pleasant on the downstairs patio!! Can't fault anything wrong with the villa or the furniture provided at all. Overall I find this an excellent choice to stay. I am considering having my 3rd stay here at the end of October 2013 and will look forward to returning again in 2014! Paphos is full of history. Visit the Tomb of The Kings or the famous Mosaics. The Medieval Fort in Paphos Harbour are where boat trips are available to Coral Bay, Peyia area and back. The villa is located within a 5 minute walk of the main Coral Bay beach which is said to be the best beach in the Paphos area, it is a sandy beach and safe for swimming where you will also find beach bars/restaurants and a range of water sports available including water skiing, windsurfing and pedalos. From Paphos Airport it is a 30 minute journey to Villa marina sunset and from Larnaca Airport it is approx 1 hour. Car hire is not essential as there is a regular local bus route which runs from Coral Bay village just 5 minutes walk from the villa which will take you to Paphos old town/market, harbour area and all of the main attractions. The village of Peyia (Pegia) is 5 mins drive away. Go carting, horse riding and Tomb of the Kings are all within 10 minutes drive with Paphos and the harbour area just 15 minutes drive away. There are various local banks, hairdressers, beauty salons, supermarkets and shops, go-carting, horse riding, tennis and a fantastic water park all a short distance away from Paphos. Booking Notes: A 20% non-refundable deposit is required at the time of booking with final payment 8 weeks before your holiday date. We have a registered management company in the resort who will meet you at the villa on your arrival. They are available 24 /7. Changeover Day: Flexible changeover days are operated, check in is 4.0pm and check out is 12.noon, our management team in the resort will be as flexible as possible but late check outs cannot be allowed until 7 days prior to arrival. Notes on prices: For May 2013 only for last min booking special offer per week £350 one week left from 18th May up to the 28th.